Once the excitement of moving to a new home transitions to the reality of the move itself, you may start seeing dollar signs flying out the window. There's no getting around the fact that moving your possessions, whether it's around the corner or across the country, is going to involve a certain amount of expenses. Fortunately, there are some practical ideas that will help you reduce or even eliminate some of your costs. We're sharing five of our favorite tips for saving money when you move to a new apartment. You may want to spend some of the extra cash on that new bed or sofa you've needed for a while! It stands to reason that your moving costs, whether you go professional or DIY, are going to be directly proportional to the amount of items you have to move. This is the perfect time to rid yourself of clothes, furniture and other possessions you no longer want or need. You might even be able to pick up additional income by selling the items on eBay or craigslist or through a consignment shop. Otherwise, recycle and donate what you can, leaving the dumpster as the last resort. Before automatically dismissing the idea of a moving service, get three or four quotes from reputable companies. It could actually be more cost-effective than moving yourself, especially if you're moving during fall or winter when demand is lower. Don’t forget that if you do it yourself, you’ll most likely have to take more time off work. Lost wages and used time off days should also be added as a cost. You could also consider splitting the difference with a hybrid solution of renting a portable storage unit that you pack and the company moves. If you're moving due to a new job or transfer, check with your company to see if they offer relocation assistance. Even if they don't have a formal program, you may be able to negotiate some financial help with your boss. Utilities will not generally pro-rate monthly charges, and it's a waste to pay for a service that you don't even use. Be sure to shut off non-essential utilities like cable and Internet before your physical move-out date. Cardboard seems like such an inexpensive resource, but you'll change your mind once you check out the price of cardboard moving boxes. Cruising supermarkets and other stores for discarded boxes is an obvious solution. Did you know that craigslist is also a great source? People will often post their boxes after they have completed their own move. Just select "Free Stuff" and search for boxes on their website. 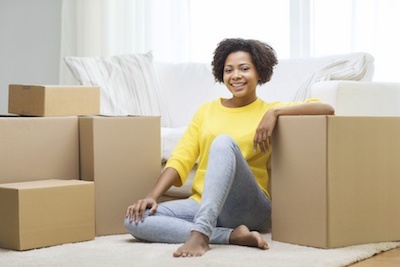 Did you find a creative way to cut costs when moving into your Springs Apartments home? Share your ideas in the comments!